There are important days in all of our lives that will live with us forever. The births of our children are obviously dates that are most important, but there are other dates that make up who we are, as well. Perhaps the date of a high school graduation or a special athletic feat or another personal milestone that will always mean a lot in our lives. And we look back on those times, hopefully with a smile on our faces, remembering the times when life’s goals were a little simpler and our accomplishments a little clearer. Day 31 was one of those days. The night before, we sat up late into the evening talking with a number of new Camino friends. Robert, a new friend from Ireland, and Donna, another new friend, this time from Australia, sat with us at our least impressive hotel of the trip in O Pino and simply basked in the comfort and confidence we were enjoying with only one day left before reaching our goal. 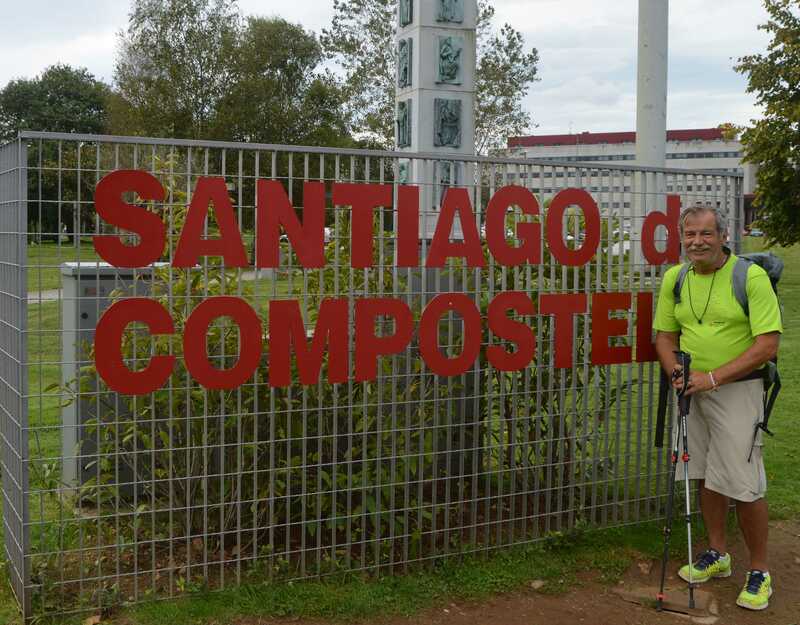 Santiago de Compostela was within striking distance and we were all aiming to reach this goal the next day. 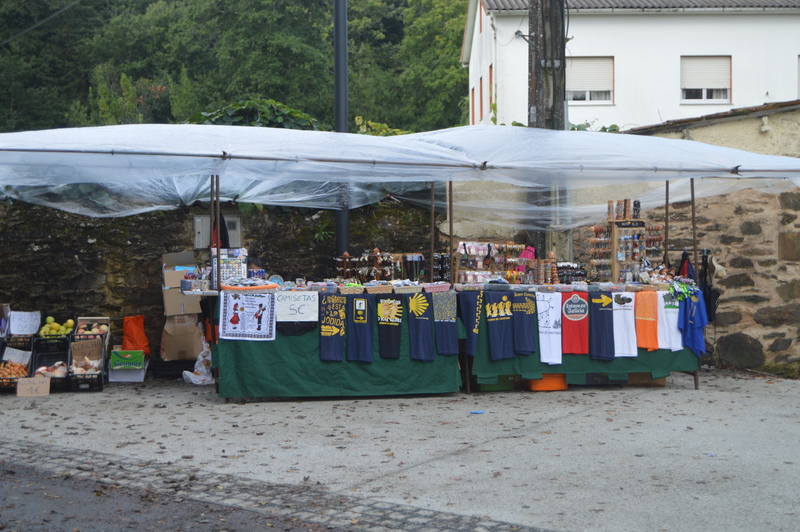 Get your Camino gear here–A vendor set up more than ten kilometers before Santiago. And we did. The day was much like many in the past. Jackie took the lead up hills and Jim kept the pace down hills. We spent some time walking with Donna and her 11-year-old son, Lucas, before our breaks conflicted and we were alone again. At the last bar before reaching the city of Santiago we saw our “old friend” Jojee, who we had met two days earlier. When we first met Jojee, a nurse from California, his feet were bothering him a lot. He was suffering from a case of trying to keep up with a tall Swedish mate, who took much longer strides and was plowing through 30+ kilometers per day. That was too much for Jojee. He suffered and was really hurting when we first met him. 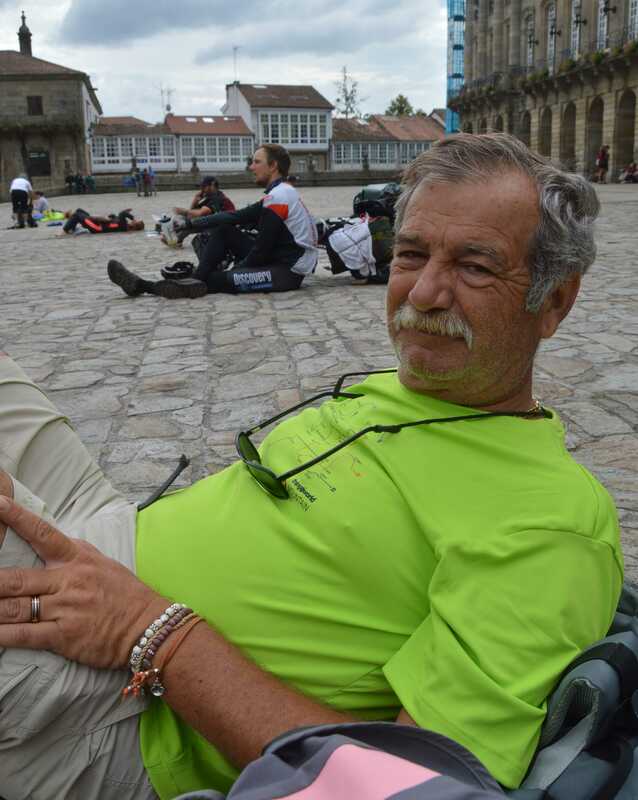 On Day 31, though, he was very upbeat and excited to be within kilometers of the goal, and was feeling much better. We laughed with him some, then it was time for the final stretch. 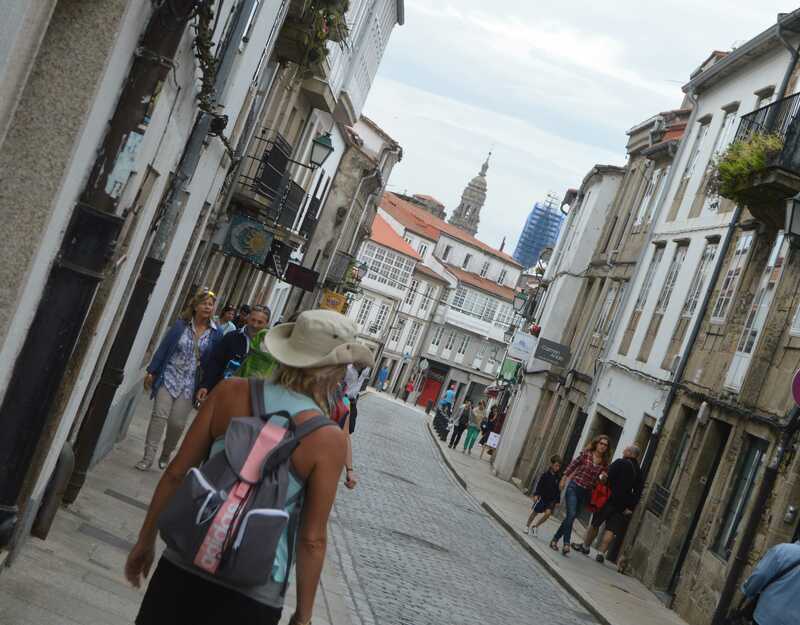 The walk from O Pino to Santiago is quite nondescript for the first 15 kilometers. More northern Michigan-like tree stands, a few tough hills and then suddenly the great monument at the outskirts of Santiago. Happy Pilgrims before the monument think they are near their goal–the cathedral. They are wrong. At the monument we were happy to see Michael, from Wise Pilgrim, again. He was standing near the monument as we arrived and called to us. He was waiting for a group that he was co-guiding, and so we laughed and talked with him we arrived. 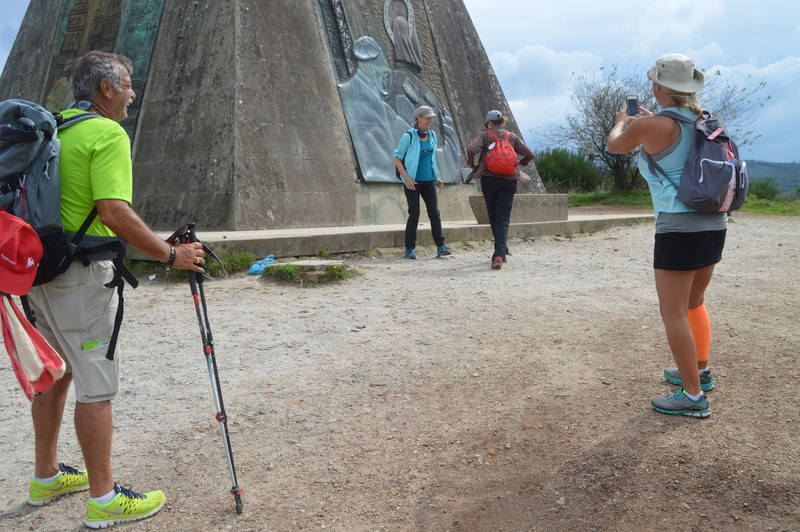 Michael took our pictures at the monument, and managed to take a photo of Jackie taking a photo for other Pilgrims at the monument. It was great fun. 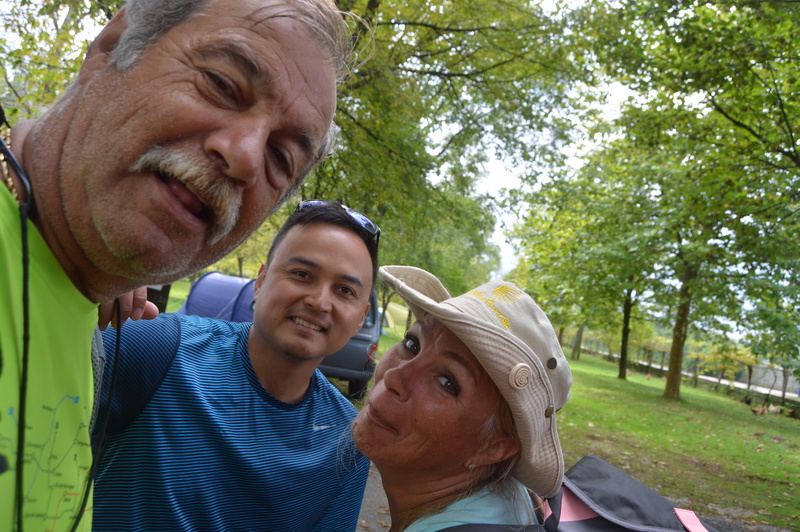 We had not seen Michael or Vanessa the day before, and she wasn’t far away, so we were able to again relay to them our excitement for their Camino plans of the future. They are gonna do great!! The city and suburbs of Santiago kind of sneaks up on Pilgrims. 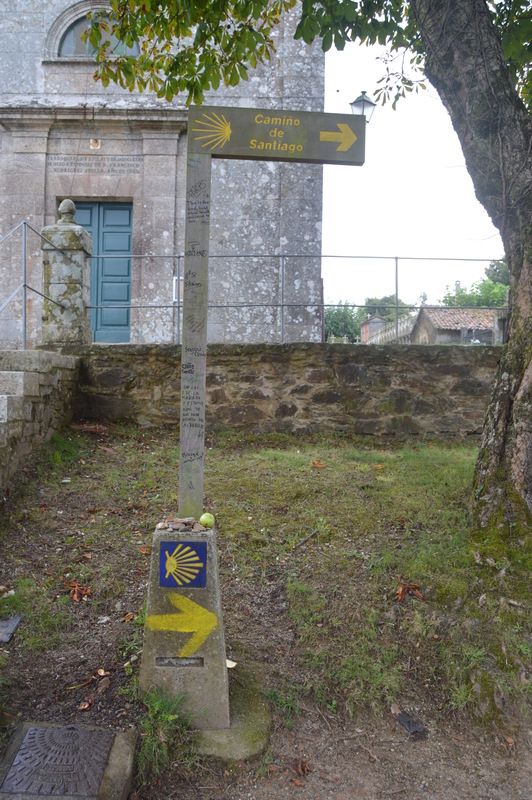 There is very little traffic in the neighborhood which the Camino passes. Some pretty houses with sparkling front and side yards. Suddenly, Pilgrims pass over two long wooden bridges, and then the bustle of city traffic and activity starts. 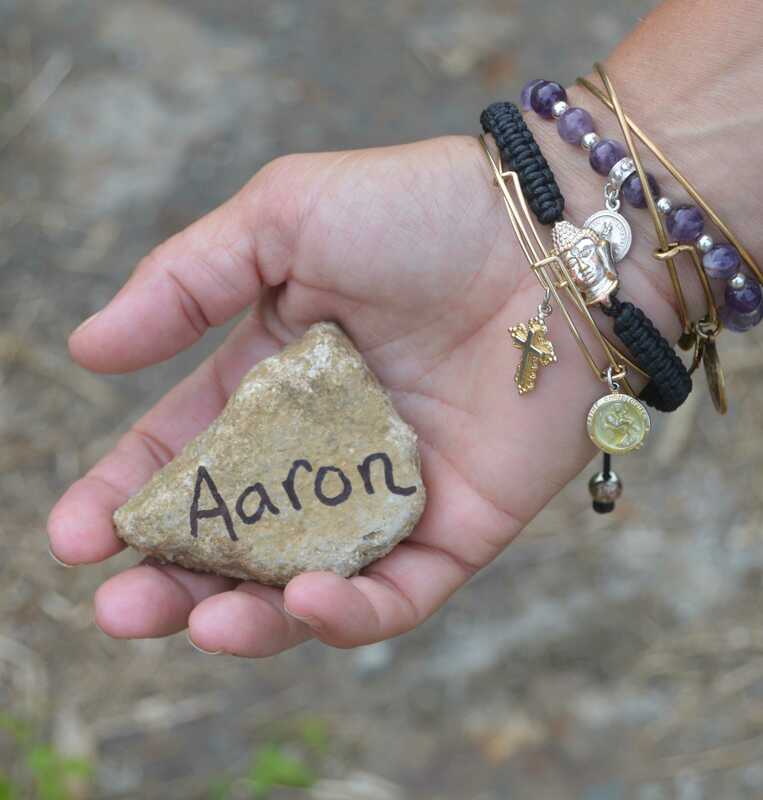 Jackie stopped at a special monument to “El Templario Peregrino” in Santiago to leave her stone for her youngest son, Aaron. Aaron is in the Air Force, stationed in Wyoming. His stone was the last to be placed of the children on our route. Jackie wanted to recognize that we were able to finish what we had begun days ago, and it was fitting that it was at the monument of a soldier whose mission was to safeguard Pilgrims. Santiago is not the longest city, but it sure was long between reaching city activity and seeing the cathedral. We walked and walked and walked, finally stopping at a bar for final Coca Cola Lights, then into the old city we trecked. Finally, turning a corner, Jackie pointed. “Look there’s the cathedral,” she said. And there, over the old city we could see the top of the church–our goal. It was at least ten minutes later before we made the final turn, then under the arch, with bagpipe welcoming us, into the cathedral square. 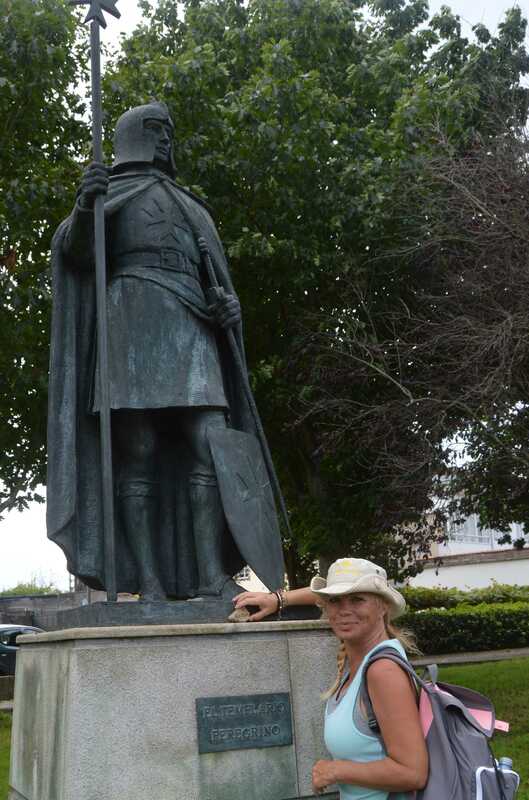 We had walked approximately 600 of the kilometers between Pamplona and Santiago de Compostela for this relief and joy that included a few tears. We had made it. There was picture taking with our new friends, hugs and congratulations all around, and after propping ourselves on our backpacks to enjoy the view of the old cathedral it was time to find our hotel. We did, and soon enjoyed very long naps to celebrate our strenuous accomplishment. 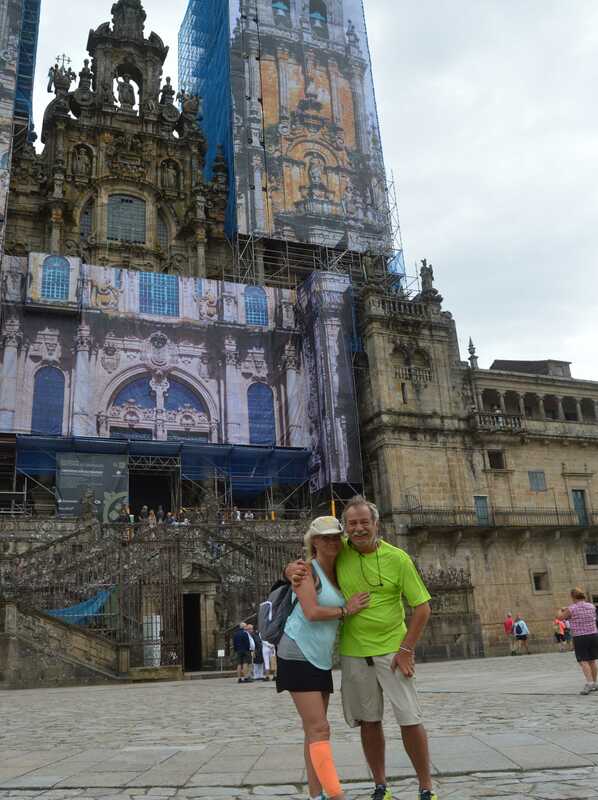 On our day of arrival into Santiago, we saw a two hour long line for the Compostela and knew that we had missed the Pilgrims Mass for the day. So Day 32, was the day for those prizes. We began our day with breakfast, then off we went to get our Compostelas, which came after a short line at the Pilgrims office. They are beautiful and mean more to us than we truly expected. As we left the line, we saw Veronica from Germany, who horse backed up O Cebreiro with us. Then, we quickly walked to the cathedral and found seats near the front of the cathedral. Sure enough the Botafumeiro was in the lowered state, which meant we would enjoy that treat. 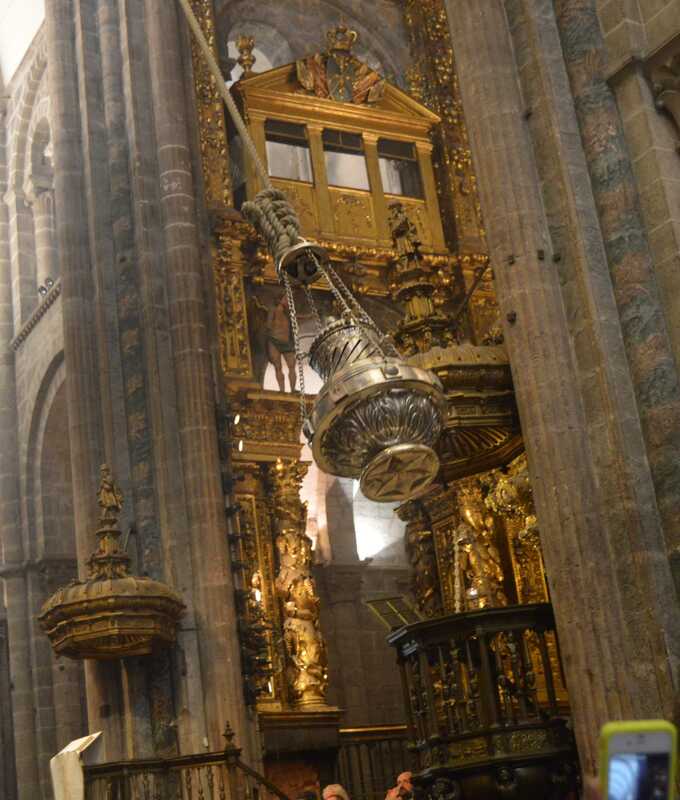 And after Mass the Botafumeiro swung. It was much cooler than we could have ever expected, and the place was jammed. Following our church time, we trucked across town to Ivar Rekve’s office to retrieve some packages that we had forwarded to him from our shopping trips on rest days in Pamplona and Burgos. Ivar is responsible for the American Pilgrim forums online. Nice guy. He was helpful and great!! It is a great service, and it was fun to wear non-hiking clothing tonight when we went to dine at a fine restaurant, where we popped a champagne cork and enjoyed our celebration. This will end the story of Our Camino. We intend to post a page of special photos at some point after returning home. We collected shots of doors along the way–that’s right–Doors!! There are some amazing doors along the route and Jim photographed as many as he could. More than once our kilometers were slow because we kept seeing beautiful old doors. We also intend to do a page reviewing the hotels we stayed at during our trip. That, too, will come later. We can’t express enough the thanks we feel for the help and support that we have been given by friends, family and readers of this journal. We have loved this journey and have both grown by it. We have tried to be upbeat in our entries, so please don’t misunderstand us–this was very difficult at times. We both had moments when we would have liked to quit, but we didn’t and are better because we worked together. We also cannot express enough the respect we have for some of those who are packing every day from St. Jean and further. They are tough–tougher than us. And we admire and love many others who have shown dignity and courage in making their journey no matter the length. That the raindrops gently wet our faces. The soft wind will refresh our spirit. The Sun enlighten our hearts. The tasks of the day are not a burden on our shoulders, and involve us in his robe of his love. That hug the road ahead of us. Which way the wind blows lightly on our backs. The rain fall softly in the fields. May God keep us in the Palm of your hand!!! Awesome! Congratulations to you both. The Trek of a lifetime. Thanks for sharing all you entries. We look forward to information regarding the hotels you stayed at. – G. Valcarcel – Miami, Florida. Thank you very much for sharing your wonderful journal! I have enjoyed and learned from it. You both are delightful. Congratulations! Felicidades/congratulations! 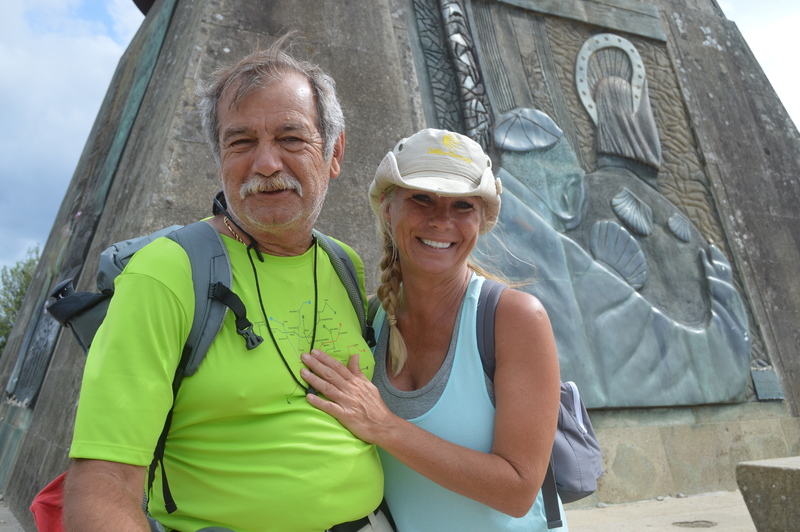 My husband and I followed your posts and I think it was just the thing to convince him to finally join me on a Camino. With your blog, I feel like I have just finished a great novel but so sad that there are no more chapters to read. So happy for you and your accomplishment. And now, your life will never be the same as your Camino will continue with every turn in the road ahead. Buen Camino! 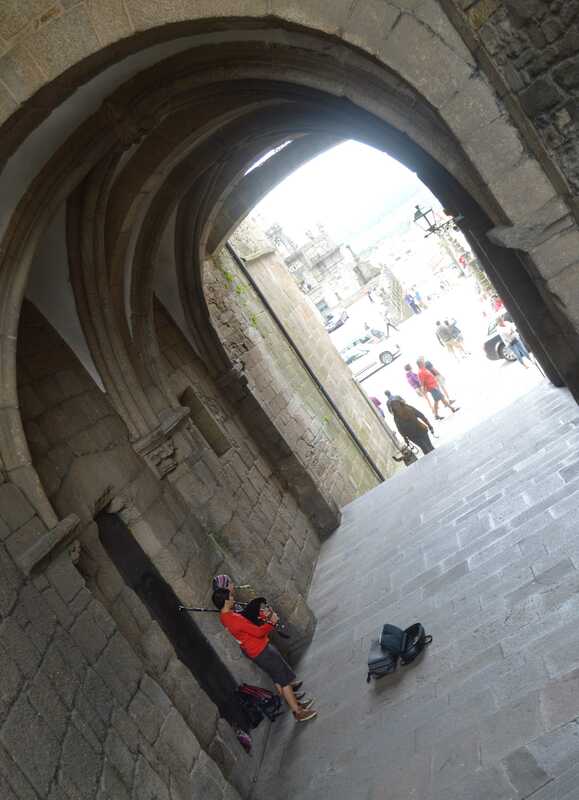 pictures and your words of your Camino. It was truly a blessing to share those moments when we walk together. I will remember your smiles and laughter. You know these pictures and never fully express the special moments along the Way. Congratulations. 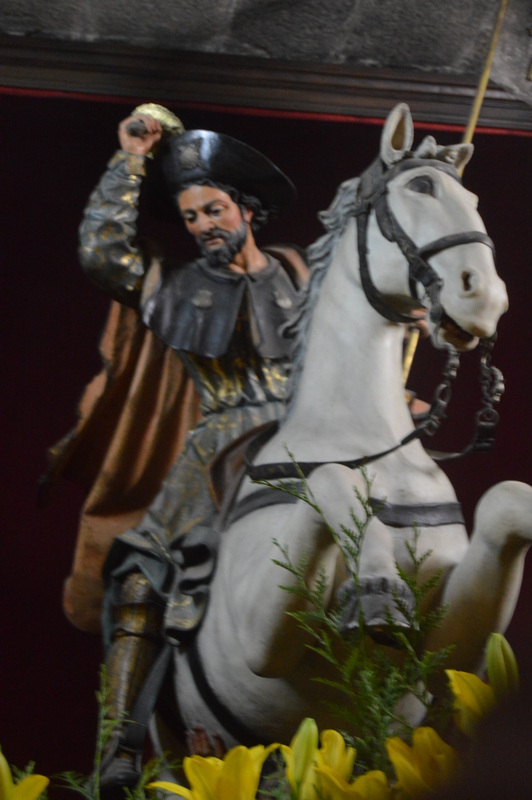 I’m happy that you’ve arrived in Santiago de Compostela, but sad to know that there won’t be a post tomorrow. You’ve been very generous in sharing your experience and my wife and I are very grateful. Safe travels home, and Buen Camino. Randy, we am so happy that you are back at home. We couldn’t have been happier to receive your note. We have thought of you a lot and I’m so glad your surgery went well. We are very anxious to get home, and I can’t wait to see you soon. We left a stone along the way for you and Mickey. God bless you both. Congratulations. I am so excited about your door photos; it was what I wished I had done! Thank you for sharing your journey. Buen Camino. 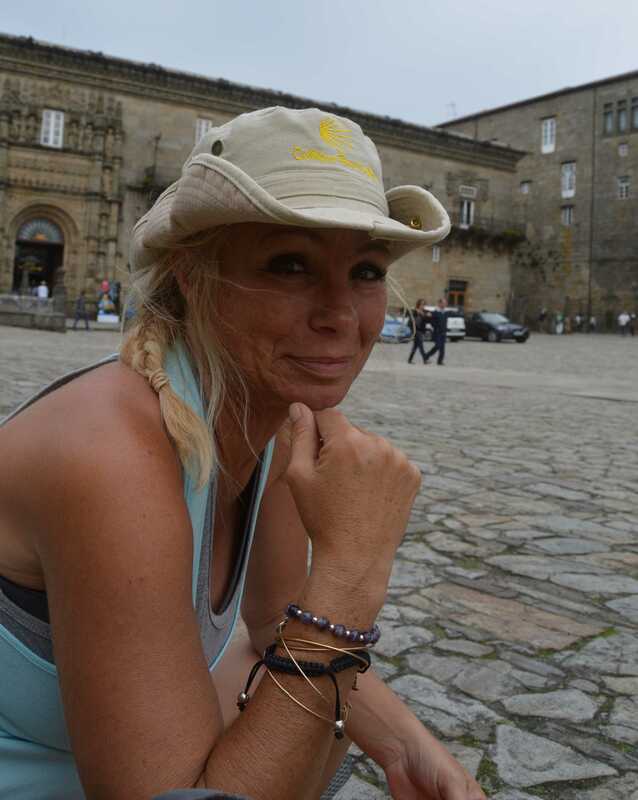 I have journeyed the Camino with you, a year and a half after your actual adventure…..and I’ve loved every moment of it. A beautiful journey shared by two beautiful people. Your posts were entertaining and informative and your pictures were priceless. Thank you for sharing. Thank you Sue. We would love to do it all again–well, maybe everything but the walking part. Do you have another adventure in your future?